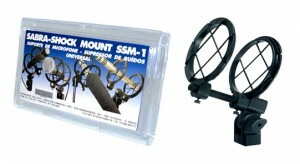 It’s versatility in mounting methods and adjustments makes the SSM-1 shockmount compatible with almost all shapes, sizes and types of microphone on the market, up to 2″ in diameter. To correctly mount a microphone, simply weave it through the parallel, high-quality, braid-covered elastic bands of each ring, two by two. 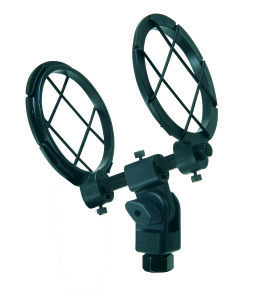 The central articulated support can be adjusted and refixed along a hexagonal rod to compensate for any imbalance in the set-up’s center of gravity. For heavier mics, insert the body of the mic into the bands without weaving, to retain the elasticity. 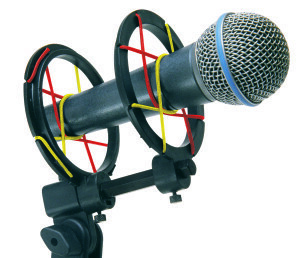 Then, if necessary, add an additional ring to the bar, by the bottom part of the mic, and weave it around the XLR connector, thus placing the weight of the mic on 3 rings at once.